Once upon a time, deep in the middle of the ocean lived a little minnow. Milo was a very scared little fish, because he was old enough to go out and live on his own. He didn't know if he was ready yet, but his friends and his parents encouraged him. Milo was a little bit insecure, because he did not know what to expect, now that he had to live on his own. After Milo left the big school of fish, he really did not know what to do with himself. His teacher used to tell them stories about the dolphins and the whales that swam on the other side of the ocean, so one of his big dreams were to swim with the dolphins and the whales on the other side of the ocean. After a few weeks of just hanging around, Milo finally made up his mind. He wanted to go on a long journey through the big blue ocean to go and swim with the dolphins and the whales. He knew that there were still many things for him to learn about the ocean, but after a visit to his teacher he had all the encouragement that he needed. So the next morning after he packed up all his things, he set of on his journey. Those little words encouraged him to continue with his journey. He swam and he swam and it often felt as if he wanted to give up. At night he was so tired that he literally fell asleep in the nearest coral reef. He knew that he would be protected there and out of harms way, but every morning he woke up very early to continue his long journey as he realized that the only way to get to the whales and the dolphins was to keep on going. He met many friends along the way and some even decided to join him on his journey. Life was not always easy for Milo and there were many times that he just wanted to turn around and go back home. His new friends however encouraged him to keep going. One day after many long months of hard work and a lot of swimming, he saw a fish that he had never seen before. He swam closer to get a closer look at this strange fish. "Hi there!' said the weird fish. "Are you Milo the Minnow?" Milo was very surprised and just nodded as he could not say one word. "We have been waiting for you little minnow. Your teacher told us about your journey, and we think that you are very brave to travel so far, King Steem wants to meet you, please come with me." Milo was super duper excited now and he could hardly breath when the weird fish showed him to King Steem. King Steem was just as excited to see little Milo.
" You have traveled the long road little Milo, and I am proud of you. I am King Steem the ruler of the ocean, and I am going to change the world for all the other minnows around the ocean. " King Steem took his fork and he knocked on the ocean floor exactly 19 times. After he had done that, a whole new wall opened up in the ocean. Milo couldn't believe his eyes. Right in front of him he saw the biggest fish that he had ever seen in his life. He thanked King Steem profusely and then turned to swim towards the big fish. Milo was totally speechless and carefully swam closer. He had never seen such a big fish in his whole life. When he reached the big fish, the big fish suddenly turned around to talk to him. "Hi I am Stella and I am a dolphin. I am here to help you reach your destination. I will protect you from all the dangers that you will now encounter. I will help you to reach the whales." Milo was very excited but he was also a little afraid. If a dolphin was such a big fish, then what was a whale going to look like? "Come on Milo, it is time for us to leave. We can't waste any time now. There are some very powerful creatures out there so I will help and protect you." Milo grabbed on to Stella's fin, and together they took on the journey. What seemed like forever they reached their destination. Stella slowed down, and told Milo to prepare himself for the biggest moment of his life. All of a sudden right in front of him Milo saw the most beautiful biggest majestic sea creature he has ever seen. He could not believe his eyes! Stella swam forward and called Milo to come and meet her friend Ned. It was the proudest moment of Milo's life. There he was, a small minnow talking to the biggest whale he had ever seen in his life. Milo was a very proud little minnow, and he now realized that determination and hard work really pays off. He now knew that he could succeed at anything in life, because he reached for his dreams. Support everyone equally on this platform. Make friends with the right people and be true to yourself. Love how you turn this into a story with morals. I think all of us can learn from this not only in steemit but in other endeavours. Will Milo have a sequel?🐟>🐬>🐳>?? Ha ha ha...perhaps..you never know with me..
Mannn, this is a great story. Well written! Hard work pays off! Upvoting and resteeming as usual. I am glad that someone enjoys my stories...thank you so much! I like your name! Your story is esp great because it is written by a giant bear. The truth of life here on Steemit...just continue and it will pay off! Just what I needed this morning @giantbear! 100% Right, hard work always pays off whatever you are doing. I was homeless once and now I have a normal life, how? Work hard! Believe in yourself! Jeeeewizzz @giantbear . This story touched every single aspect of Steemit! Wow! King Steem with his fork...19times! Hahaha. Brilliant! Nice piece! I think my son would enjoy the story, though he wouldn't understand the references to dolphins, whales, etc,. Ag make up your own parts in between. Lol! Great post. Hard work is always rewarded! Beautiful story and very up lifting. Thanks I'll take Milo lead. Very nicely written! You are very talented giantbear! I really liked Reading your story about Milo. Good morals and very relatable! "Milo, if you don't try then you will never succeed" What a well said, and I like the way you express by using a story line!! That is inspiring and brings me motivation ! Though I am still a little "Milo" here, I am striving hard and I truly believe hard works will pay off one day! For me the first step that is the hardest. It may look like a child's story, but the lesson should be taken.good story. Oh so true, not just on steemit but life in general. Hard work pays! I know for sure that you have imagination! This is uncanny - it is very similar to a recent story I wrote on my blog about a minnow chatting to a whale. Luckily we are on a blockchain and I have NEVER visited your blog. I don't know what you are implying here? Possibly but I can assure you that if you search hard enough you will find even more similar stories. Minnows, dolphins and whales are terms often used here. I will check out your blog. 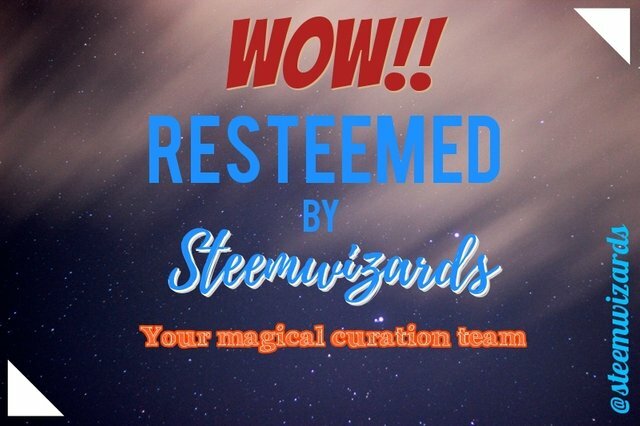 I love reading stories and I have found some excellent stories right here on Steemit. You can check out @richq11 he is an excellent writer. Good luck with your steemit journey!